For the residents of Moldova the registration fee can be paid in Euro, or in Moldovan Lei at an exchange rate of the National Bank of Moldova for the date of payment. The citizens of other countries should pay the registration fee in Euro. By bank transfer - the payments must be effected before April 20, 2005. The name of organization, country, city and name of participant should be indicated in Payment Order. Payments in cash during the registration are also accepted. In this case the Conference participant must present in advance to the Organizing Committee the Guarantee Letter confirming that the payments will be made on registration site. Bank Name: FinComBank, Field Branch #1. Bank Address: 2012 MD, Chisinau, 26 Pushkin Street. Beneficiary Address: 2009 MD, Chisinau, 60 Mateevici Street. Full address of FinComBank: MD-2012 Republic of Moldova, Mun. Chisinau, str.Puskin, 26. Address of Beneficiary: MD-2009, Repubic of Moldova, Mun. Chisinau, 60, Mateevici Str. If the need appeared to substitute a participant with another person after the payment have been made, the appropriate Notice Letter should be presented to the Organizing Committee, signed by the manager and accountant of paying organization. The family and the first name of former participant should be indicated in this Letter, as well as information on the new participant. The Registration Form for the new participant should be attached. The participants are free to refuse from the participation in the Conference any time. Regretfully, due to the organizational and technical reasons, the Registration Fee can only partly be repaid. Once the written denial of participation is received before May 1, 2005, the Secretariat will repay 80% of transferred funds with the less the bank commission. 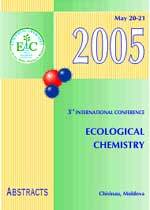 Once the denial of the Conference participation is received later than May 1, 2005, the Registration Fee will not be repaid.